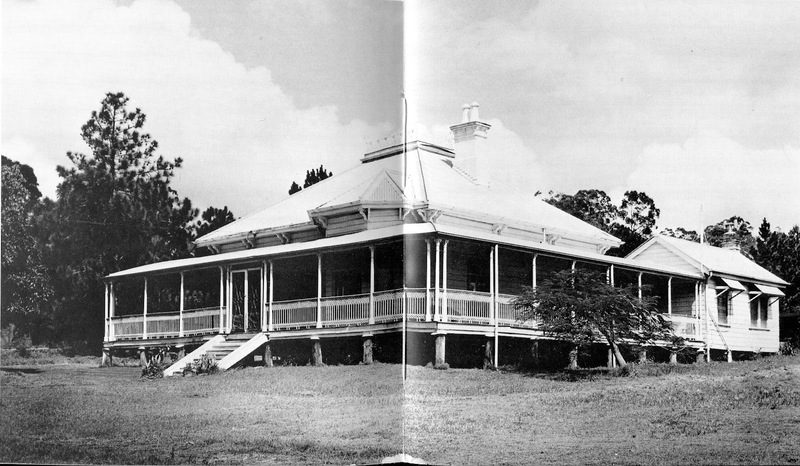 This building is what we Queenlanders (people) think is the archetypal Queenslander (house). 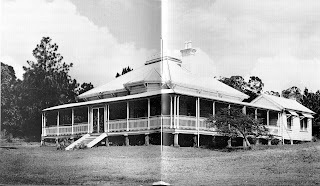 It is situated on one of Brisbane's busiest corners and is passed by thousands of cars and buses each day.The house is known as Hughesville after its original owners, the Hughes family. Hughesville stands at Eight Mile Plains on Logan Rd, which, prior to the advent of the M1 Motorway, used to be Highway 1 between Brisbane and the Gold Coast. 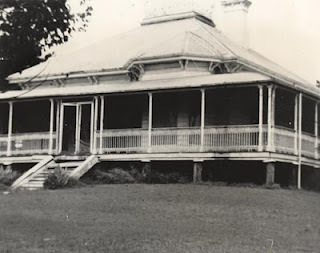 So the house has been a well-known landmark for many years - I remember it well, because any trip to the southern beaches took you right past it, and its delightful symmetry and grassy surrounds attracted the eye each time. In truth it is probably not representative of most Queenslanders in size - it is quite a substantial structure - but it has all the attributes. It is raised above the ground on stumps for ventilation, it is surrounded by verandahs to keep the hot sun off the walls and it has a steeply pitched metal roof to slough off the rain from those afternoon tropical thunderstorms we get here. Fred Hughes was a Brisbane livery-stables owner whose business premises were in Charlotte St. He also owned property at Mt Gravatt where he bred and kept horses including Arab stock. After his son Richard was married, Fred Hughes arranged for this large house to be built on Richard's land at Eight Mile Plains in 1892-3. The designer was George T Campbell-Wilson, a Queen St architect whose father, George W Campbell-Wilson, was also an architect. Eight Mile Plains was originally a heavily timbered area that later became rich farmland. Hughesville would have been the finest house in the district. The house remained in the Hughes family for over a hundred years. After that the house hit hard times and deteriorated markedly. I'm sure that everyone who passed it must have felt as I did - surely "they" (whoever "they" might be!) are not going to let this piece of history fall down in ruins. There were rumours of the structure being removed to enable the land to be developed, but there was wide community support for this wonderful example of our past not to perish. Eventually Hughesville's luck took a turn for the better. The Queensland Heritage Council approved a development that provided for a subdivision of part of the still-extensive property for a townhouse development, if combined with the restoration of the house. Here is a before/after comparison from their newsletter. There was further good fortune too. The Queensland brewer of XXXX beer shot a television ad there, featuring the house as a make-believe restoration project for some couples who relaxed with XXXX drinks on the refurbished verandahs after their pretend heavy painting activity. This ad obviously had a commercial purpose, but it also allowed Queenslanders to see that the old girl was being "done up". Hughesville is now owned by a firm of solicitors and it is listed on the Queensland Heritage Register. Many of us dreamed of owning this home or one just like it... doesn't look quite the same without the large area around it now, but glad it has been restored. Yes, I was one who looked enviously at it too. Glad it's still there. Wow - I haven't thought about that place in years. Like yourself I remember driving from Pine Rivers to visit my grandparents in Woodridge in the mid 80's and always going past it. I used to always hope for the traffic light to change just before we got there on the way back so I could get the most time to look at it. Thanks for some wonderful memories - not just of the house, but of your blog in general. I am living over in Canada now, and check every week to see what you have added. I am amazed at the depth of research that you do, and the knowledge that I have gained about literally dozens of places I remember from my youth and early working life in the city. I imagine that you have a great deal of satisfaction from doing this, and I hope that people in the right places recognise you for your hard work - your blog should be linked to the state library website, and made to be compulsary learning for all Brisbane schoolkids!! Thank you again for all that you do, and I hope you keep doing this for a long time to come. I'm sorry for the belated reply - I have only just noticed your post. Thank you for such a lovely message. I am always pleased to hear that people are reading the blog and enjoying it. And it's especially pleasing to find out that it is being read half-way around the world away from Brisbane. Have fond memories of visiting Hughsville by invitation from my school buddy Gloria Hughes in the 1950s. After so many years the family is perpetually imprinted in my mind as if they were my own. I used to ride the horses through the paddocks and surrounding bushland. Ah to see my friend again. Jannice Cunningham nee Gamble.